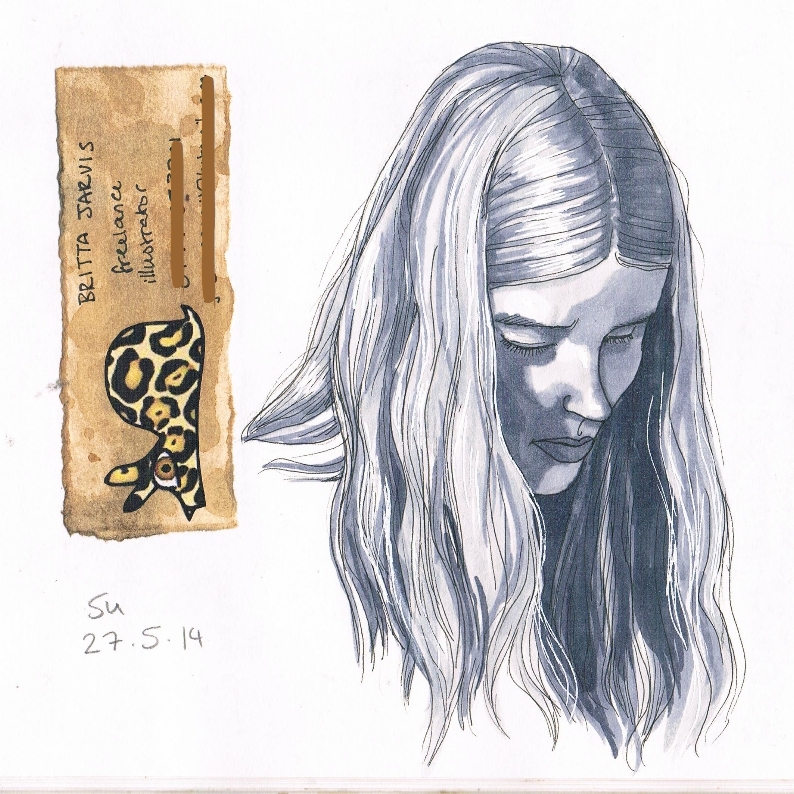 Britta (see JaguarSnail section of the TangleStore) popped round yesterday on another miserable, rainy day, which we brightened up with lots of junk food & an afternoon of crafting. 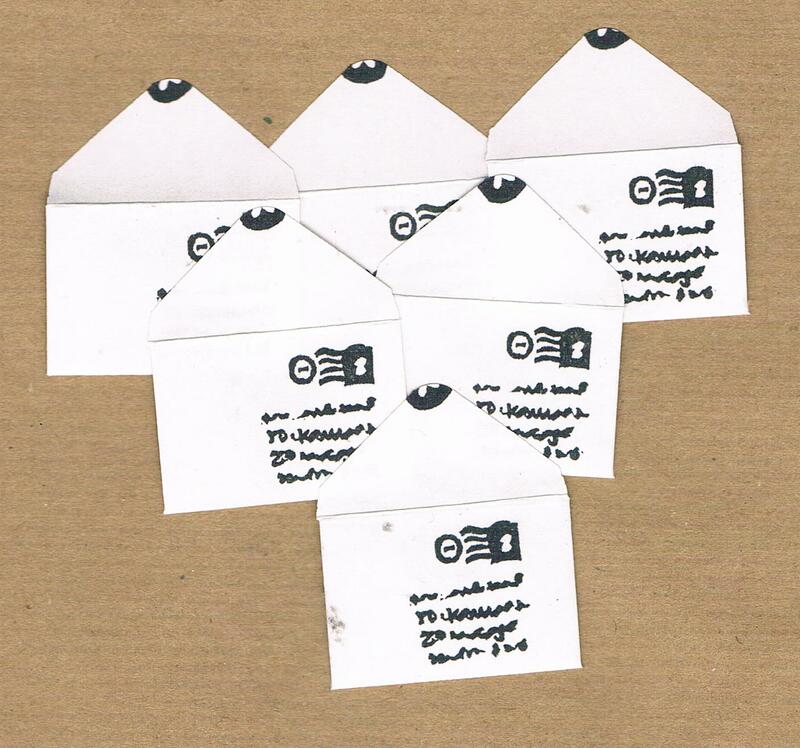 Britta made (almost) the teeniest tiniest envelopes imaginable, measuring just 1″ x 1.5″ and embellished with a handcarved stamp of even teenier tinier faux postage, postmark & ‘handwritten’ address (she also made pandalopes from a poster salvaged from her erstwhile teenage bedroom). December frequently escapes me somewhat, with birthdays, increased busy-ness at work, and the forthcoming seasonal festivities, all piling on top of my days which already feel very full. But earlier this week I did manage to make time for another get-together with the lovely Britta of JaguarSnail. We had some fun playing with my new envelope punchboard – we struggled to follow the instructions, bluffed our way through to success by trial & error, then found that the instructions did make sense, after all… 😉 I really love the results & there will definitely be new TangleMail-designed envelopes coming soon (probably not until the new year). Britta brought with her a brand new zine, the seeds of which were sown on our last crafternoon a few weeks ago. On that day she made a miniature mock-up of the concept, and I have to say she’s done an awesome job of following it through. If you have ever aspired to invent a new life form, this is the mini-zine for you! Each page features an ordinary creature – man, lion, eagle, cobra, goat and carp (some interesting choices!) 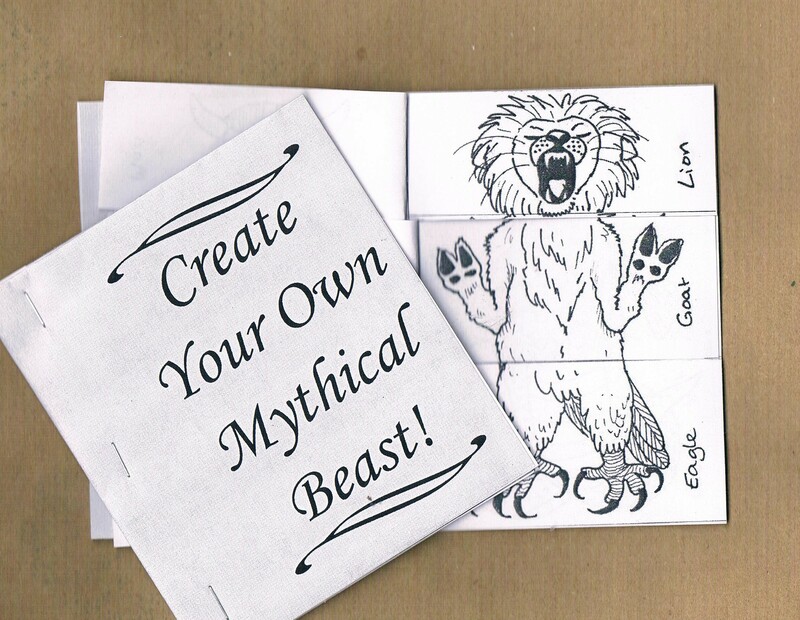 – and each page is split into 3 segments so that you can mix & match your own mythical beast! There is even a section at the back of the zine where you can log and name your favourite hybrid creations. The drawings are really cleverly done, with lots of character, and perfectly aligned so that any combination (of the many possible!) slots together smoothly – yet another example of Britta’s talent! There are only currently 5 copies available of this labour-intensive, slightly-larger-than-average mini-zine, so don’t miss out! 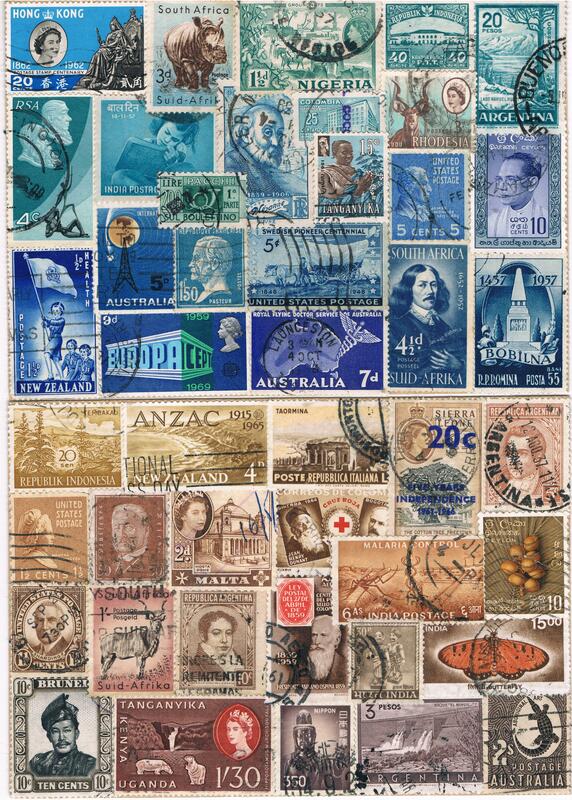 Britta was also inspired by the sea of stamps that were overflowing in a corner of my craft room, and followed up on her previous stampy works by customising a couple of stray notebooks I had lying around. One of these was snapped up overnight (the other is still available, at time of writing), inspiring me in turn to follow her example – see pic to the right for even more First Class Notebooks, this time stampified by me. These are all one-of-a-kind creations, so if one of them catches your eye, be quick! Britta and I generally have no problem thinking of new creative ideas, but our ‘crafternoons’ are definitely motivational for both of us to actually get down to putting the ideas into practice. 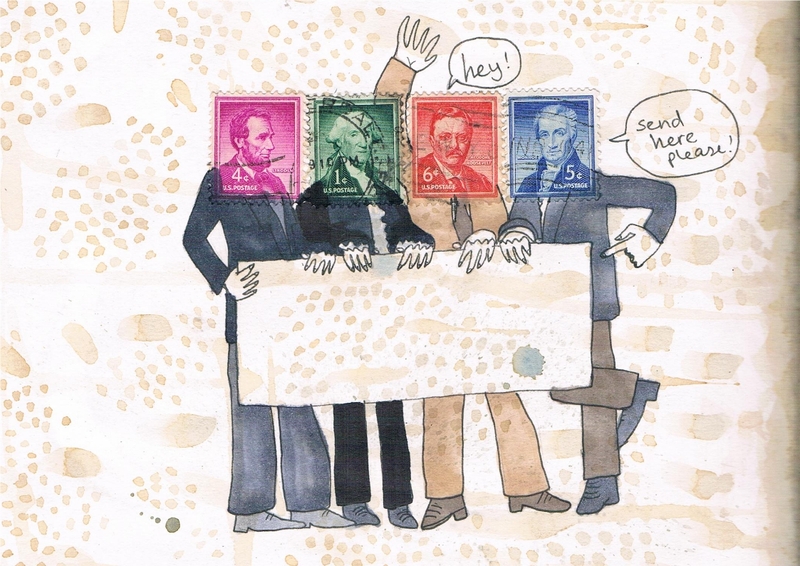 When I say that a sea of stamps was overflowing in my room, I’m actually being literal rather than gratuitously poetic – but now we have actually made a real start on crafting them, I feel far less like I am about to drown in them…! One of the items in the TangleStore which ticks over regularly is this set of 3 ‘Instructional Craft Badges‘, featuring vintage book illustrations and ‘sage advice from bygone crafters’. I was singularly tickled to receive an email yesterday from Kris Bailey with a pic (below) of what she had done with her set! Putting slight feelings of inadequacy aside (suddenly my plain kraft packaging looks somewhat lacklustre…) I’m sure Kris’ friend Jan* will adore this witty, hand-lettered, handmade birthday card with badges for embellishment – so much fun! 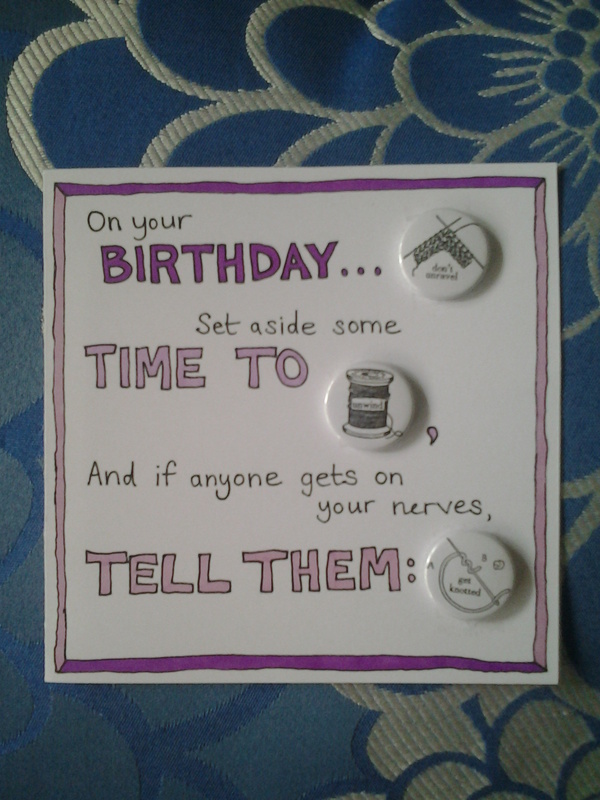 I’ve been thinking about making some cards to go with the badges for ages (who doesn’t love a badge on their birthday card – especially if it doesn’t tell their age! 😉 ), and Kris has definitely provided me with some inspiration here. With reference to this recent post, I have just added A Handy Pouch – Simple Sewing Tutorial to the TangleClub Archive. The file sizes were quite large so I have split the PDF down into 3 smaller chunks, for ease of download. Have fun – would love to see results if any of you try it out! If you are not yet a TangleClub member, but want to share the crafty freebie goodness, never fear – it’s very easy to join! 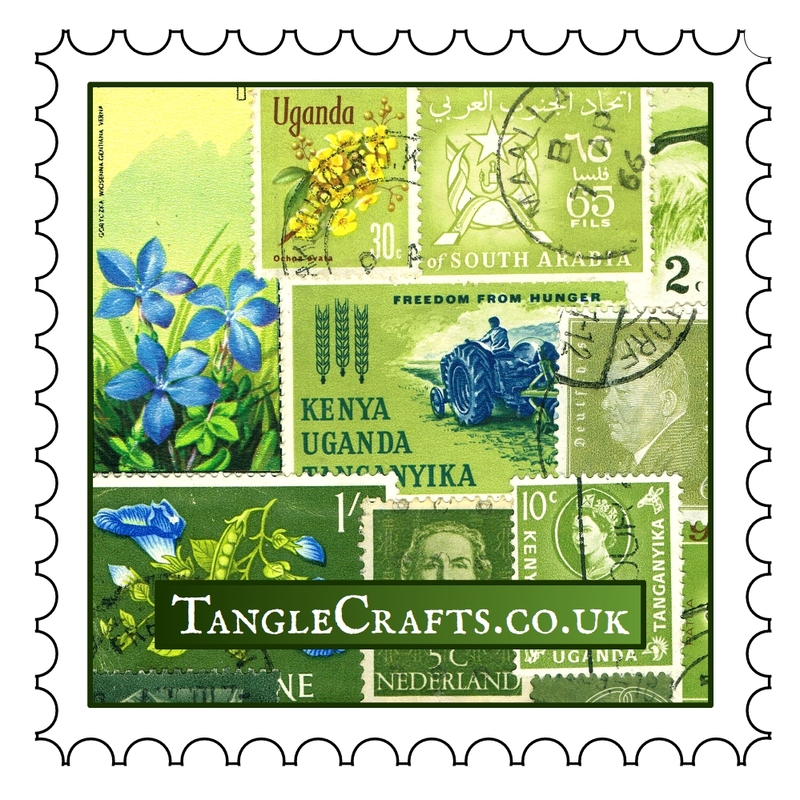 You can still get FREE TangleClub membership with any purchase of £5 or more from the TangleCrafts Etsy Store, or click here for all current options.